Smartphones are an integral part of most people's lives, allowing us to stay connected and in-the-know at all times. The downside of that convenience is that many of us are also addicted to the constant pings, chimes, vibrations and other alerts from our devices, unable to ignore new emails, texts and images. In a new study published in NeuroRegulation, San Francisco State University Professor of Health Education Erik Peper and Associate Professor of Health Education Richard Harvey argue that overuse of smart phones is just like any other type of substance abuse. "The behavioral addiction of smartphone use begins forming neurological connections in the brain in ways similar to how opioid addiction is experienced by people taking Oxycontin for pain relief — gradually," Peper explained. On top of that, addiction to social media technology may actually have a negative effect on social connection. 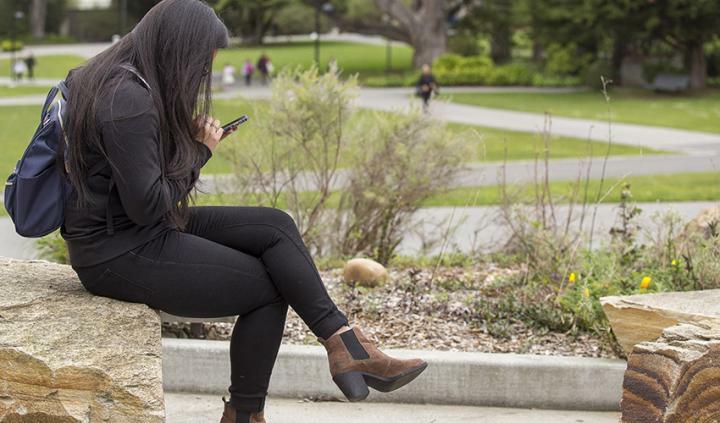 In a survey of 135 San Francisco State students, Peper and Harvey found that students who used their phones the most reported higher levels of feeling isolated, lonely, depressed and anxious. They believe the loneliness is partly a consequence of replacing face-to-face interaction with a form of communication where body language and other signals cannot be interpreted. They also found that those same students almost constantly multitasked while studying, watching other media, eating or attending class. This constant activity allows little time for bodies and minds to relax and regenerate, says Peper, and also results in "semi-tasking," where people do two or more tasks at the same time — but half as well as they would have if focused on one task at a time. Peper and Harvey note that digital addiction is not our fault but a result of the tech industry's desire to increase corporate profits. "More eyeballs, more clicks, more money," said Peper. Push notifications, vibrations and other alerts on our phones and computers make us feel compelled to look at them by triggering the same neural pathways in our brains that once alerted us to imminent danger, such as an attack by a tiger or other large predator. "But now we are hijacked by those same mechanisms that once protected us and allowed us to survive — for the most trivial pieces of information," he said. But just as we can train ourselves to eat less sugar, for example, we can take charge and train ourselves to be less addicted to our phones and computers. The first step is recognizing that tech companies are manipulating our innate biological responses to danger. Peper suggests turning off push notifications, only responding to email and social media at specific times and scheduling periods with no interruptions to focus on important tasks. Two of Peper's students say they have taken proactive measures to change their patterns of technology use. Recreation, Parks and Tourism major Khari McKendell closed all of his social media accounts about six months ago because he wanted to make stronger face-to-face connections with people. "I still call and text people but I want to make sure that a majority of the time I'm talking to my friends in person," he said. Senior Sierra Hinkle, a Holistic Health minor, says she has stopped using headphones while out walking in order to be more aware of her surroundings. When she's out with friends, they all put their phones in the center of the table, and the first one to touch theirs buys the drinks. "We have to become creative and approach technology in a different way that still incorporates the skills we need but doesn't take away from real-life experience," said Hinkle.